Thank you Carrie for the link to this story! When I first read it, I looked at the date to find out if it was an "April Fools" story - because I was in shock! When my family and friends outside of the U.S. ask me what the atmosphere is like here in terms of multilingualism, I realize it is very difficult to pin-point any specific attitude or overarching reactions. This is a big country and depending where you happen to be standing at any given moment, you will find different reactions to the words "bilingual," "multilingual" and "multicultural." To highlight this point, read this story in CNN and you will get one aspect of a very large and complicated picture. Comments such as, "We should replace bilingual education with immersion in English so people learn the common language of the country and they learn the language of prosperity, not the language of living in a ghetto" from Newt Gingrich are simply from a position of ignorance. Of course, Gingrich's statement primarily has a political goal in the setting in which it was made: he is trying to win over a certain portion of the population by making statements which will ring true with them and to win their political support. But think of the "cheers from the crowd of more than 100" after Gingrich made the statement that he did. Why are they cheering? Are they really so frightened of bilingualism? Why do they equate bilingualism with the ghetto? Is it not because this is NOT an issue of language... this is an issue of immigration. On the one hand, a presentation like this from someone like Newt Gingrich makes us multilinguals laugh loud and hard because it is nothing but hilarious: we can see what a mishmash of topics he has tried to thrust together: Bilingual Education, Immigration, Multilingual Voter Information. These are three very distinct issues which can not be answered with one simple statement! And this man wants to run for president!? Yet, on the other hand, this frightens us to death because the audience loves it! They don't care about the nuances of these issues. Gingrich is simply adding fuel to a fire that is already blazing (albeit under muffled breaths sometimes) and that can be frightening to us multilinguals! Our role in all of this? First of all, we need to remember that the U.S. is a country of contradictions. This is a LARGE country with many differing opinions. This is also often a country of extremes. It sometimes feels that "either you are for it or against it" as our current president has enjoyed using against us and other countries. But we should not cater to this "either or" attitude. Show yourself. We need to continue showing the world that we are multilingual too. We need to be proud of our multiple languages and to not feel we should hide who we are. Don't stop speaking Spanish or French or Arabic or Hindi with your child when you are on public transportation. Continue speaking your language despite what others may think and say. Don't overdo it but also don't change what you already do naturally out of a concern about the reaction of others. Help to gently educate. It won't help if we force our multilingualism down everyone's throats. As the saying goes, "You can catch more flies with honey." Explain to others why we are multilingual and the benefits that it has overall. If someone says something to you on the bus such as, "Why don't you learn English!" then take a deep breath and create an image in your mind of how frightened they feel and how you threaten them through your being different. Then calmly say, "Actually, I can speak English. However, I have chosen to raise my child bilingually in Spanish AND English. Have you heard about the benefits to the brain that bilingualism can provide?" Then leave it at that. If they become belligerent, move to another seat or ignore them. Stand up for your multilingualism. Don't let institutions make you feel small about your multilingualism or make you feel like what you are doing is wrong. When you enroll your child in school, make sure the school understands the details of your child's multilingualism and how you are delighted to work with his or her teachers to bridge any gaps that may exist. Foster an understanding in the institutions where it really matters. Emit inspiration. Be a beacon for the world of multilingualism through your joy and connectedness to your language and culture. Your enthusiasm for your language and cultural mix will rub off on others even without you having to make an effort. Remember that although there are Newt Gingrichs in this country, there are also Maya Lins and Richard Rodriguezes! Multilinguals DO outnumber monolinguals in this world (even if not yet in the US). It shouldn't be a surprise that people are a little nervous about us. So, let's have compassion but let's not accept their delineations of who we are. And, for goodness sake, we should be helping people out of ghettos, not putting more into them, even if only figuratively! Think the rest of the U.S. is behind us in our effort to raise our children bilingually, or that they even understand what the terms "bilingualism" and "bilingual education" really mean? Well, perhaps but just barely if you take the poll listed on the left of the CNN article. Last I looked, when asked "Do you agree with Newt Gingrich that bilingual education teaches "the language of living in a ghetto"? only 56% said no. I'm not sure what that means in the whole scheme of things. I'm sure it is more complex than what it seems at face value but it basically tells me that there is a lot of education that needs to happen in this country! The comment illustrates Newt's arrogant and dated thinking. Thanks for your comment! Yes, I agree 100%! By the way, your blog looks great! I will have to spend some time there to check it out in more detail. Anyway, I hadn't read Zach's story and I was FLABBERGASTED by it! Unbelievable! Great post, I want to link to it and write about this issue in my blog soon. I tagged you! Stop by and play along when you have the time! Lilian: Yes, it isn't it just crazy!? I sometimes think that things are changing, people are coming to understand that bilingualism and multiculturalism are not the enemy! Of course, Newt is an idiot, but still, he represents the opinion of many who don't speak up. Oh goodness, this is almost laughable if it weren't such a serious topic! 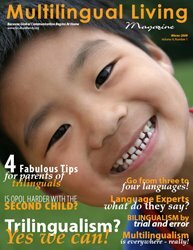 Bilingualism "dangerous"?!?! "Long-term dangers to the fabric of our nation?" What the ?!?! Why not just declare outright that Bilingualism is joining the axis of evil, now? Brua-hahaha! OK so I guess this is not really funny but tremendously pathetic and very sad. I just can't stop shaking my head at all this nonsense. Anyway. There are politicians like this all over the world. There are certain politicians here in Austria as well who make a gigantic issue against having bilingual sign boards (Ortstafel). For heaven's sake. It's like the fabric of our nation could be endangered because of that. I won't say no more. Yep, ignorance and fear all over the place, unfortunately. That man doesn't have a clue what he's talking about. We've met with a fairly positive attitude when people realize that our kids are raised bilingually but more from a "Oh, they must have it easy in school" point of view than a "Ahh, I see, you're passing on your language and your culture to them." But anyway. Alice and Christina: Thank you both for your comments! I know this guy is an idiot but he actually has a position of power in the US... that makes me so angry! How do people like this get to positions where they can actually influence (or at the very least encourage) such skewed views!? Arghhh. Well, it certainly makes me all the more motivated to make MLM and BBFN an even stronger force in the world! We must counteract ignorance!